One takes life with a bit more ease where the lemons blossom." That's how tourist officials characterize the Pfalz, and what they term its "Tuscan feeling." The climate is the mildest in Germany. The Haardt Mountains and the Vosges Mountains in France shield the area from the cold north winds. The almond trees bloom in March and, according to tourist literature, "here, in the southernmost part of Rheinland-Pfalz, kiwis and figs flourish; chestnuts, tobacco and, of course, wine ripen." One could do worse than be stationed in the Kaiserslautern Military Community. The Pfälzer Wald Nature Park, the largest wooded area in Germany, is right on your doorstep. So is the German Wine Road, a string of gem-like wine villages, castle ruins and fruit trees. The Wine Road begins in the north at Bockenheim, west of Worms, and passes through the Pfälzer Wald, ending 60 kilometers further on at Schweigen on the French border. The principal cities on it, both picturesque and an easy drive from Kaiserslautern, are Bad Dürkheim and Neustadt. Bad Dürkheim is the site of the annual "Sausage Market" in September, which, despite its name, is actually the biggest wine festival in Germany. It takes place in front of the "world's largest wine barrel," which was actually made according to barrelmaking principals. It could hold millions of gallons of wine, but instead holds a restaurant. The Pfälzer Wald Nature Park has an extensive network of marked hiking trails. There are numerous parking areas where you can start a walk and every hour or two you'll come to a pleasant tavern where you can rest and refresh. There are 12 circular routes for the more ambitious hikers, and you can cover as much as 400 kilometers without going on the same path twice. You don't need to lug a pack, either. There is a service that will take your luggage from hotel to hotel. The Hambach Castle, on the Wine Road near Neustadt, is a shrine to German democracy. It was the scene of a big festival in 1832 at which some 30,000 persons demanded an end to the oppressive regimes of the day. The rulers of the many petty German states were, under Austria's Prince Klemens von Metternich, striving in the post-Napoleonic era to restore their feudal privileges. Liberal groups, notably student organizations and the followers of Friedrich Ludwig Jahn, were well represented at Hambach, demanding freedom of the press, religious tolerance and even a democratic German union. Needless to say, the festival was followed by a wave of arrests and new laws to suppress liberals. But the democratic spirit continued to burn and eventually prevailed. Among other things, the Hambach demonstrators had boldly displayed the red, black and gold that had been the colors of an elite infantry unit with which some of the freedom fighters had fought in the Napoleonic war. These colors now are used on the German flag. Visitors to the castle can trace the history of the 19th century democratic movements. The area was primarily agricultural until the early 1950s, when Cold War realities set in. Overnight the mission of the USA and its allies shifted from that of occupying a defeated country to manning the front lines in the struggle against the Communist world. It was necessary to get a large part of the forces, particularly the logistic operations, west of the Rhine. The Americans moved into the Kaiserslautern area in 1952 and the city quickly grew into the largest US military community outside the United States. Some 40,000 service men and women are still based in the area. The money the Yanks brought has enabled the city to almost completely rebuild. The towering modern city hall (Rathaus), with a viewing platform on top, was built from 1964-1968. The big population of Americans leads to some lively nightlife with a good jazz and rock scene. Acts from the US come over regularly to perform in Kaiserslautern's numerous clubs. Kaiserslautern is a lively student city, the football citadel of the southwest and the cultural center of the Palatinate. Those who want to enjoy a good Palatinate wine, regional specialties or an excellent cuisine can find what they want in the earthy wine houses or excellent restaurants in the city. Yet Kaiserslautern's rich historical past has been preserved. The Stiftskirche, a church in the center of town, is the oldest structure, dating from the 13th century. Kaiserslautern earned its name as the favorite hunting retreat of Emperor (Kaiser) Frederick Barbarossa who ruled the diverse lands of the Holy Roman Empire from 1155 until 1190. The Lautern was then an important river that actually made the old section of Kaiserslautern an island in medieval times. Barbarossa built his imperial palace, the Kaiserpfalz, there in 1152 on a site near the present-day Rathaus. There are many cultural activities including a year-round offering of operas, musicals and plays. Two museums house a rich collection of Palatinate history, folklore and art, and there is also a Beer Tankard Museum with more than 500 exhibits from the last 200 years. From April to October the city hosts a World Garden Show including a beautiful Japanese garden and Europe's largest dinosaur exhibition. The city also has a zoo and a downtown skating rink, and the pleasant Volkspark offers Sunday concerts. The landmark of Landstuhl, the imposing castle ruin Burg Nanstein, was also built by Barbarossa, to guard the western approach to Kaiserslautern. But the real claim to fame of this castle, which sits atop a sheer cliff, is a later owner, Franz von Sickingen, the so-called "last knight" and Landstuhl's "favorite son." Though he was romanticized in Goethe's Götz von Berlichingen, Sickingen epitomizes the reasons why knighthood declined in Europe. His lifetime (1481-1523) was "late in the game" as far as chivalry is concerned. Because the knightly forays had become more a matter of greed and profit than political justice the institution in its feudal sense had all but died out in France and England by Sickingen's day. It persisted in Germany, though, until Sickingen brought it to a final conclusion. He took the Protestant cause during the Reformation, fighting to secularize church property, and incidentally to enrich himself. He made the mistake of taking on the Archbishop of Trier, and was defeated when the castle at Landstuhl was besieged. He died of the wounds he suffered during the fight, and visitors to Burg Nanstein can see the cellar chamber in which he succumbed. 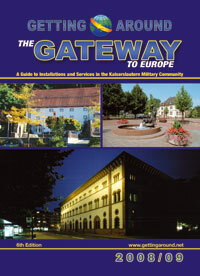 Landstuhl is an official resort town with a good infrastructure. Leisure activities include a public swimming pool, a culture and convention center, tennis courts, bike and hiking trails, a shooting range and a fishing pond. The first documentary mention of Ramstein dates from 1215, and throughout most of the centuries since then the region was dominated by agriculture. It was completely destroyed in the Thirty Years' War and occupied by the French during the Napoleonic Wars. Ramstein became a station stop on the Landstuhl-Kusel railroad in 1868, and got its first factory, a textile mill near the railroad station, in 1898. Further textile mills were then opened, creating jobs and increasing Ramstein's population to more than 2,000. The construction of the air base changed the employment picture. Labor was needed in its building and afterwards in its operation. And, of course, private businesses also flourished with all of those airmen and their families as customers. Ramstein has more bars per capita than any other community in Germany. In 1969, Ramstein incorporated neighboring Miesenbach, and those two towns, plus nine surrounding villages, now are consolidated into the present "union community," of Ramstein-Miesenbach. Today, this community has a combined population of more than 18,000. The local museum presents special exhibitions. Leisure activities include a public swimming pool, riding stable, shooting range, sports fields, tennis courts and bowling lanes. With a population of 50,000, Pirmasens, an imaginatively restored city and the one time center of the German shoe industry, is the urban center of southwestern Palatinate. The city, located right in the Pfälzer Wald, was founded by Count Ludwig IX (1719-1790), who chose the area for his residence and military garrison. The parade ground on which he loved to drill his troops still is called the Exerzierplatz. Strict though he was, Ludwig is nevertheless fondly remembered as a very enlightened ruler for his time. An even more towering figure was his wife, Caroline of Hesse-Darmstadt (1721-1774), whom Goethe called the "Great Countess." She was good at marrying her children into the proper families, and Frederick the Great paid her the best compliment his misogynistic nature could muster: "sexually a woman, intellectually a man." Ludwig was indirectly responsible for making Pirmasens a center of shoe manufacture. His garrison was disbanded after his death, creating a great economic stress in a town that had been dependent on the pay of the soldiers. To help make ends meet the ex-soldiers fashioned the leather parts of their uniforms into simple shoes called Schlabbe, which their wives then set out on foot to sell. That was the start of a considerable shoe industry, remnants of which can be seen to this day. Unfortunately, like other elements of the clothing industry, much of the shoe production has now moved to areas of cheaper labor. But there is a Shoe Museum where you can see the history of this industry, and visit an old-style workshop in which craftsmen still make Schlabbe. The town also remains a center of shoe industry technology. The Shoe Museum is located in the Old Town Hall in the pedestrian zone, which also houses the Museum of Local History, the Bürkel Art Gallery (with works of the local painter Heinrich Bürkel) and a Museum of Silhouettes, exhibiting the works of Germany's most important silhouette artist, Elisabeth Emmler. Pirmasens has another museum that should be of interest to the military history buff. The "Westwall Museum" gives the history of the Siegfried Line, which was started in this area in 1937 to face the Maginot Line across the border in France. It was never finished because the German invasion of France in 1940 made it unnecessary. Some of the line's bunkers have now been made into a museum. The city has suffered reverses of late. But it has coped well with the "one-two punch" of the demise of the shoe industry and the withdrawal of most of the US military presence. The downtown area has a new look. The establishment of a pedestrian zone has attracted several new retail stores and the picturesque old city has been made attractive to bars and restaurants. Exploring all this on foot will at least keep you healthy. Pirmasens varies in altitude from 259 to 446 meters, and many of the streets are staircases. Early guidebooks called Pirmasens "the town on seven hills," leading outsiders to call it "the Rome of the North." Locals call Rome "the Pirmasens of the South!" This city, capital of the tiny German state of Saarland, is a lesson in European history. The state is right on the French border and rich in coal, and therefore was an object of contention between France and Germany. It changed hands four times in the 20th century. That sort of thing now appears to belong to the past. Saarbrücken is the center of an international economic and cultural region made up of Germany's Saarland, the French province of Lorraine and the Grand Duchy of Luxembourg. The area is important not only for its coal but also for its two major rivers, the Mosel and its tributary the Saar. Visitors to Saarbrücken head for the St. Johanner Markt with its boutiques, bars, bistros and restaurants. It's an ideal place to meet people or saunter through the narrow picturesque streets scattered around the market square. The entire old town is now an auto-free pedestrian zone, and there is a direct view of the castle from the Baroque fountain. Another must see area is the Deutsch-Französischer Garden. This large recreation area has a lake with a water show as well as a narrow gauge railroad that visitors can take to tour the park. There is also a cable car that crosses the lake into the heart of the park and an outdoor amphitheater that features live performances. The terrace restaurant at the Saarbrücken Casino looks out over the lake and park. The "Alte Brücke," originally built in 1546 and decorated with gargoyles, was one of the bridges that gave Saarbrücken ("Saar Bridges") its name. Right next to the bridge is the mooring of passenger boats that offer round trips along the river in the summer. A Baroque former hotel is now the Saarland Museum, with a Kulturcafé and summer concerts and art exhibitions in its delightful courtyard. When the "Alte Brücke" was shortened to make room for a riverside Autobahn, some of the gargoyles were moved to the castle wall. One of them you will see there is the "miserly baker," who is being ridiculed for refusing the help the poor and demanding that women customers present their bodies in payment for their bread. The castle wall provides a beautiful panoramic view of the town. Neunkirchen , only a 20-minute drive from Ramstein, is an attractive place. The site of an abandoned steel mill has become the Saarpark Center, the biggest shopping and amusement complex in Southwestern Germany. A big water tower at the Saarpark houses a four-screen movie theater and a Hooters Restaurant. The latter offers telecasts of American sports and lovely Hooters girls, clad like cheerleaders, who serve beer by the pitcher. The water tower also houses a brewpub, the only one in the Saarland. Neunkirchen also has a zoo that is allegedly bigger than the famous one in Frankfurt. A former coal and steel community, Neunkirchen is also a monument to the Saarland's industrial past. You can take walks on the Hüttenweg ("Ironworks Path") and the Grubenweg ("Mine Path") to get an idea of how it once forged steel and mined coal. The big attraction of the Saarpark is the water tower, with a movie theater attracting 2000 people a week. Its four screens are against the tower's circular outer walls, giving the audience a 180-degree multiplex effect. The sound is also unique in this huge metal cylinder. Other facilities in the tower include a fitness studio and the "Coyote Café," a Tex-Mex establishment with DJ music, a candlelit tapas bar and the vinothek "Destino." Then there is "Stumm's Brauhaus," with copper kettles that produce four different brews on the premises; light, dark, weizen and the pub's own specialty. The name of the pub comes from the Baron von Stumm-Halberg who owned and operated the steel mill. And the tower also houses the Hooters restaurant, a male attraction if there ever was one. There are TV screens all over the place featuring American sports. It is open till at least 1 a.m., and until 3 on Fridays and Saturdays. Directly across from the Water Tower is the Saarpark Center. This is a shopping mall that is mostly indistinguishable from malls that are found in the USA. There are 121 retail outlets and about 34,000 square meters of shopping space. It is the largest shopping center in Saarland. Multi-leveled, bright and elegant, shopping there is an incredible experience. Most stores are open until 8 p.m. every day except Sunday. It is very easy to find and includes parking for 2,400 cars. Neunkirchen's zoo is home to some 1,200 animals of some 180 species. There are Asiatic elephants in the new Elephant House with a big fenced outdoor area where they can roam freely. There is a herd of baboons on the baboon cliffs, and a jungle house with giant snakes, lizards and an array of exotic fish, including piranhas. The beavers have a pond of their own, with a dam. There are giraffes, zebras, ostriches, leopards, camels, bears, kangaroos, emus and seals; eagles and owls in a bird hall, and a playground and petting zoo for the kids. The converted water tower is only one part of the extensive industrial complex that produced steel throughout the 19th and most of the 20th centuries. The visitor can still get a pretty good idea of the plant's industrial importance by walking the three-mile Hüttenweg. A huge floodlighted gas tank there dominates the city at night, and you can climb to the top of a blast furnace for a good view. Also interesting are the relics of the paternalism that marked German industry in an earlier era. There are worker's houses, schools and churches. The man behind this was Karl Ferdinand Stumm (1836-1901), owner of the mill and the image of a 19th century industrialist. Kaiser Wilhelm II recognized his feats by elevating him to become Karl Ferdinand Freiherr von Stumm-Halberg. The Grubenweg is another reminder of the city's past importance. It's a three-mile circular hiking path connecting the sites of several one-time coal mines. There are guided tours along it when the weather is good, and tablets to explain things to those who undertake the walk without a guide. Also to be seen along it is Baron von Stumm's riding hall, now a theatrical center, and his chapel. Neunkirchen, with a population of 50,000, is the second largest city in the Saarland. It was a steelmaking center for a long time because of the presence of coal and iron ore in the area; there is documentary mention of steel production there in 1593. It was in 1806 that Baron von Stumm's grandfather and two of his brothers took over some production facilities. That was the start of a century-long dynasty that ended in 1901 when the baron died without a male heir. Instead of being a one-industry steel town Neunkirchen is now a diversified center of production and services. It's helped by its favorable location right at the intersection of two major Autobahns; A6 (Mannheim-Saarbrücken-Paris) and A8/A1 (Karlsruhe-Trier-Cologne). And the presence of the Saarpark Center has also been important. Neunkirchen is located about 12 miles northeast of Saarbrücken, in an area that Wolfgang von Goethe praised for its picturesqueness.